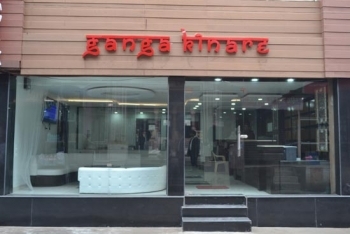 Hotel Ganga Kinare is a 3 star luxury hotel situated on the banks of river Ganga in Haridwar. The hotel provides ultimate hospitality to the devotees, pilgrims and visitors coming to Haridwar city. Manage by the team of professionals, the hotel focus on the customer satisfaction by providing a comfortable accommodation and facilities to the guests making it one of the best hotel in Haridwar. The hotel offers a mystic view of serene river Ganga coming after crossing Har ki Pauri. Guests could use the private ghat in the hotel or take bath in Har ki Pauri itself located at a distance of 1.5 km from the hotel. Major places to visit in Haridwar such as Chandi Devi temple, Maya Devi temple, Mansa Devi temple, Bharat Mandir and many more are located near to the hotel. Situated on the banks of Ganga river 1.5 km before Har ki Pauri, the hotel is at 800 mtrs from Bus stand. Major places nearby : Haridwar City center (1 km), Har-ki-pauri (1.5 km), Railway Station (1.5 km), Bus Stand (0.8 km), Jolly Grant Airport (35 km), Rishikesh (21 km), Mussoorie (82 km) and Dehradun (54 km). The hotel offers 25 well decorated luxury filled rooms categorizes in Executive Double Bed, Premium Double Bed, Suite, Executive Suite and Royal Suite. All rooms are well furnish, spacious and have modern amenities such as AC, Cable TV, telephone, carpeted floor, attach luxury bathroom. A multi cuisine restaurant in the hotel serves a good varieties of food such as Indian, Chinese, Thai, Italian and Continental cuisines. The restaurant is tastefully decor to provide a delighful dining experience to guests. Roof top restaurant provides an arial view of Haridwar city while dining. The hotel can be reach by hiring cycle rickshaw, auto or taxi and even by walk (if without heavy luggage) from Haridwar bus stand located at a distance of only 800 mtrs. Jolly Grand Airport (32 Km) is the nearest airport from Hotel Ganga Kinare in Haridwar. Haridwar Railway Station is at just 1.5 Kms from hotel and connected by numerous trains. Haridwar has well connected motorable road route to all major cities. There are regular buses from Haridwar to other cities like Delhi, Dehradun, Chandigarh etc. From Delhi, one can take bus from ISBT Kashmeri Gate to Haridwar.